Update: The datasets are now available for download! We propose the first real-time approach for the egocentric estimation of 3D human body pose in a wide range of unconstrained everyday activities. This setting has a unique set of challenges, such as mobility of the hardware setup, and robustness to long capture sessions with fast recovery from tracking failures. 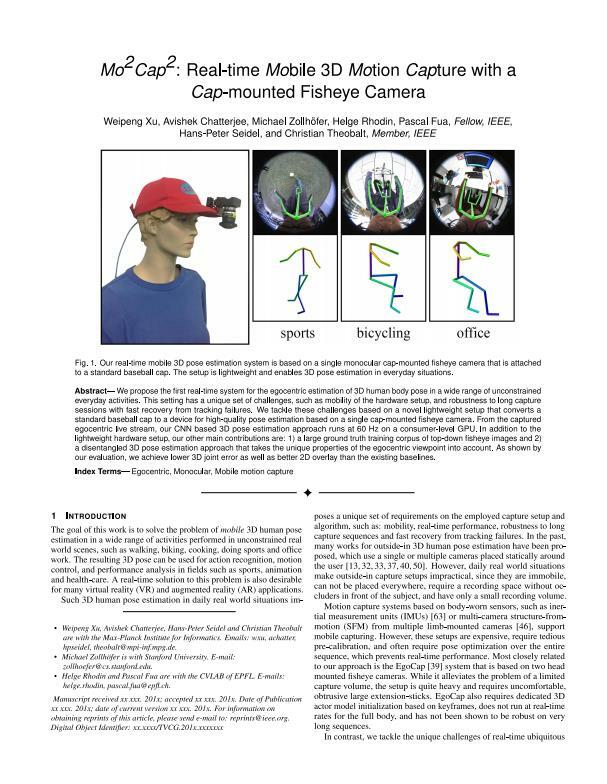 We tackle these challenges based on a novel lightweight setup that converts a standard baseball cap to a device for high-quality pose estimation based on a single cap-mounted fisheye camera. From the captured egocentric live stream, our CNN based 3D pose estimation approach runs at 60 Hz on a consumer-level GPU. In addition to the novel hardware setup, our other main contributions are: 1) a large ground truth training corpus of top-down fisheye images and 2) a novel disentangled 3D pose estimation approach that takes the unique properties of the egocentric viewpoint into account. As shown by our evaluation, we achieve lower 3D joint error as well as better 2D overlay than the existing baselines.